Is it meaningful to study if you don’t have a clear goal? During your six years at Saint Joseph, we’ll equip you with the skills to help you discover the goals which will guide you through life. We live in a rapidly changing and uncertain age. What can we do to live happily in such times? The answer lies in learning what is important in life while abiding by our own unchanging principles. Since our earliest days, we at Saint Joseph have educated sutudents to become women of grace and intelligence. These qualities become part of every student’s character. By acquiring these principles, every student is able to discover her true self. Based on the teaching and values of Christianity, Saint Joseph educates each one of our students to become an independent young woman. Both in and out of the classroom, our goal is to develop students who display these values in equal measure in their daily life. The Christian teaching of “Light of the World, Salt of the Earth” is a philosophy of devoting oneself to others and working for the good of society. We nurture students’ empathy for others and help them grow in kindness. Our students carry books and other heavy items for teachers going to and from classes. At the start of class the “door girl” welcomes the teacher to the classroom. Of course, after class she sees the teacher off with a smile. These acts are not favors asked occasionally, but are the natural result of the students’ own thoughtfulness and are an integral part of daily life here at Saint Joseph. This kind of attitude naturally extends to our volunteer activities. Our students all experience the joy of helping others. Since 1986, Saint Joseph students have participated in a volunteer activity called the “Walkathon”. The first Walkathon raised funds for needy people in India, Peru and Nicaragua. More recently, we have raised money for Chernobyl, the Philippines and Sierra Leone, as well as people affected by the Great East Japan Earthquake in 2011. These fund are used to buy vital medicines and provide education for those most in need. 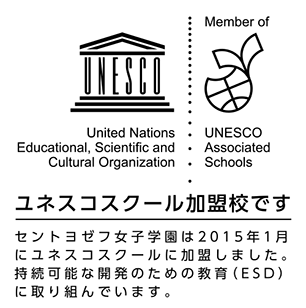 Like all schools in Japan, we have sports and culture clubs, but unlike many Japanese schools we also have clubs geared towards spiritual development. By learning English our students become more internationally-minded and learn to see the world through new eyes. In the process of learning English they can discover more about Japan and discover a sense of self. English is an integral part of life at Saint Joseph. Our native speaker teachers are always available for students to talk with, both inside and out of the classroom. Students do not need to worry, as we encourage them to use English to communicate their thoughts and feelings in whatever way they can. This is where good communication begins. By using English in this way every day, without realizing it, it becomes their own. When participating in their first study trip overseas and talking with their host family, our girls are always so happy to be able to communicate in English. This provides tremendous motivation for English study. We offer the students several oppotunities to experience homestays overseas, as well as encouraging them to take the nationally-recognized Eiken Test in Practical English Proficiency. We also provide opportunities for our students to enter overseas universities. All of these allow our students to achieve their English study goals. On a day-to-day level, many of our homeroom classes are carried out in English, and of course our English classes are conducted entirely in English, both those taught by native speakers and those taught by Japanese teachers of English. There are limitless opportunities for our students to listen to and use English in their daily life. Moreover, many of students take part in activity called “Let’s Enjoy English”, where they visit nearby elementary schools and teach a fun English lesson to the students there. This is entirely carried out in English, of course. This experience gives our students great confidence in their ability. Every year we are pleased to host overseas students from a variety of English and non-English speaking countries. Our Japanese students can often be seen chatting with our overseas visitors, strengthening their international ties. In recent years we have welcomed students from the USA, Canada, Australia, Garmany, New Zealand, France, Slovakia, Finland, Thailand, Taiwan and Singapore. Our school was founded by the Sisters of Saint Joseph of Carondelet, and this Congregation has six high schools and five universities across the United States. We have made pledges of cooperation with the eleven institutions shown below. Students and teachers from these schools often visit us, and our students and teachers visit them in the USA. The six years of education at Saint Joseph nurture our students’ grace and intelligence. Our girls have many opportunities to get to know and appreciate other students throughout the school, regardless of year group. They form friendships with girls both older and younger than themselves. In English classes they are streamed into groups according to their academic level. This allows students to proceed at a pace best suited to their ability, and has the added benefit of allowing them to become friends with students outside their own homeroom. Our school has a system of “sistership” in place, where older students mentor younger students by showing them that their seniors support them, but is also a wonderful opportunity for the older students to experience the joy of teaching and supporting someone who needs their help. Our beautiful surroundings and the seasonal changes they display enrich our students’ lives and encourage their compassionate sensibilities. Because Saint Joseph is an all-girls school, our students are able to grow in confidence and explore their leadership abilites. Opportunities include the school sports day (Josephimpics) and the Christmas Carol Singing Contest. Our school was founded by the Sisters of Saint Joseph of Carondelet. This Congregation originated as a small group of Catholic nuns in 1650 in Le Puys, France. In 1836 a group of these nuns emigrated from Le Puys to Saint Louis, Missouri, in the United States. There, they founded the mother house in a small suburb of Saint Louis called Carondelet. Now, the Sisters can be found not only in the American continent, but also in Japan, Peru, Chile and Uganda. There are now 1200 Sisters in the Congregation worldwide. In 1956, in response to a request from the Govermor of Mie, Mr.Satoru Tanaka, four Sisters came from America with the aim of establishing a mission school in Tsu. One of these Sisters, Sister Irmina, founded our school, with the objective of instilling within each student a noble character, a clearly definedsense of morals and a broad world view. The high school was established in 1959, with the junior high school following two years later in 1961. 1956 – Four Sisters arrive in Japan from America. 1959 – Saint Joseph Joshi Gakuen Senior High School is established. The founder, Sister Irmina bedomes the first Principal. 1961 – Saint Joseph Joshi Gakuen Junior High School is established. 1965 – Sister Shelia Marie become the school’s second Principal. Saint Joseph is the first school in Mie prefecture to use an audio system in English lessons. 1968 – Sister Barbara Mary becomes the school’s third Principal. 1977 – Sister Miki Nakatsu becomes the school’s fourth Principal. 1988 – The YMG club win the Chunichi Bluebird prize. 1989 – The school receives an award for volunteer work from the Minister for Health and Welfare (and future Prime Minister of Japan) Junichiro Koizumi. 1991 – The current school uniform is introduced, including a checked skirt. 1995 – The school’s S-Club is certified by the International Soroptimist Mie Iris. 1998 – The school’s volunteer clubs win a national prize at the National Youth Volunteer Group Contest. 2008 – Extensive earthquake-proofing work is carried out in the school buildings. 2009 – 50th anniversary of the school’s founding. 2010 – Sister Midori Saito becomes the school’s fifth Principal. 2013 – Security auto-locks are installed on all external doors in the school. 2013-2014 – Sister school relationships with affilated American schools, colleges and universities are formalized. EEC (Enjoy English Club) have started an English web page for everyone. The page is written by students about students. We will update the site every few weeks with articles about our school, clubs and student life at St. Joseph. Copyright 2018 © Saint Joseph Joshi Gakuen. All Rights Reserved.